The crust of the Funky Fat Head Pizza is primarily made of cheese and almond flour. 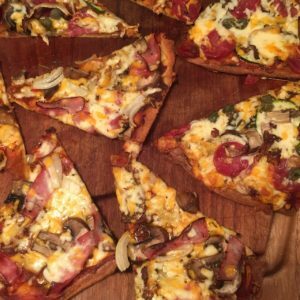 My alternative pizza recipe is made with cauliflower and Pofiber. 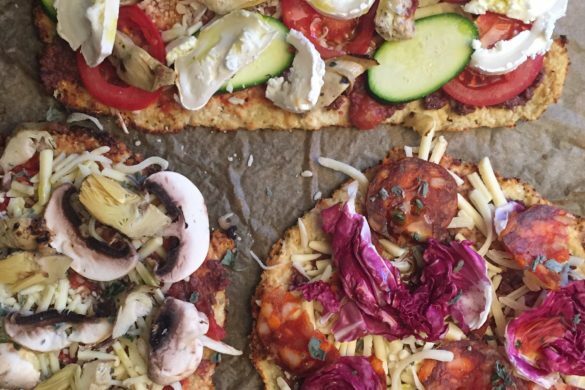 Many people find the cauliflower crust too soft, and Pofiber is not available outside Scandinavia, therefore enjoy this Funky Fat Head Pizza instead. I prefer this one myself! 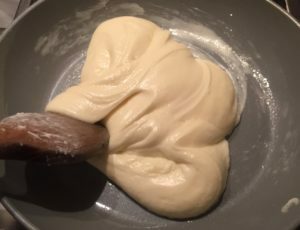 You might have tried the Fat Head dough already as many keto fans adore it, and recipes are everywhere on the internet. 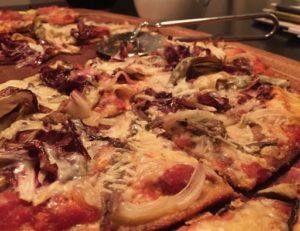 What you’ll experience with this funky pizza is that you can only eat a few slices because it’s filled with healthy fat. I serve salad to the pizza. The pizza will be perfect on a buffet. Preheat the oven, 200 C/400 F.
Put the cheese and the cream cheese together on a non stick frying pan, and let it melt at a low heat while preventing it from burning. Keep the melting cheese in motion. 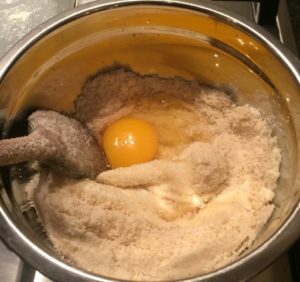 When completely melted like shown in the picture, it takes 3-4 minutes, then add the other ingredients starting with the almond flour. Divide the pizza dough into two (or four), and make a thin pizza crust of each of them between two layers of parchment. Reuse the parchment paper. Use a rolling pin or manage this with your hands. Pinch the dough with a fork. Bake the pizza crusts for 10-12 minutes. Cool a bit afterwards. To make a Funky Pizza you need another 300 gr grated cheese. Choose a variation of ham, sausage, mushrooms, anchovies and artichoke hearts. Style with capers, oregano and garlic. You can choose your own favourites but don’t use too juicy ingredients. First of all add a good tomato sauce and/or black olive paste to the slightly cooled pizza crusts. Then add a thin layer of grated cheese. 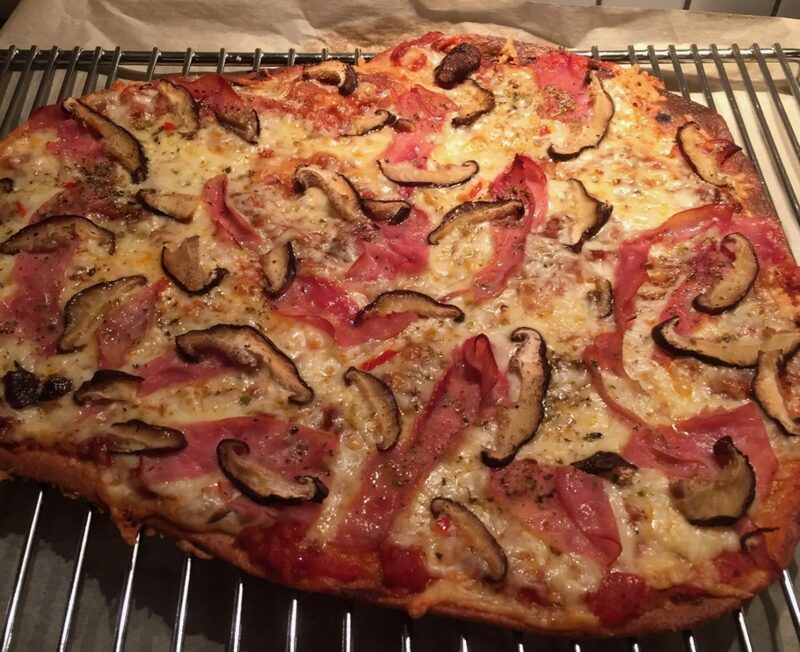 I add only few ingredients because I like my Funky Pizza to be simple and the toppings to be heated properly. Bake the pizzas once again at 220C/440F for 8-10 minutes. Keep an eye on them after 8 min. The crust must not be too brown but the toppings and the cheese should simmer. You can divide this amount of Fat Head Dough into two, three or four pieces, if you prefer to divide your taste of pizza toppings like that. Furthermore, the crusts are very cool used as wraps, which therefore demands a smaller size.